This year I heard one of the two shops close by had closed, and after heading by to check it out, noticed that was the case. Shoreline Comics in downtown Long Beach is no more. It makes a sad sense. The only books they shelved were from the Big Two and really popular licensed content, and tried to live on the margins of a marginalized industry, feeding off of a diet of tourists. In an area where rent is finally getting out of control, the tourist-only market proved too lean. So there was the only my main shop, Pulp Fiction. They had an arrangement with Food Bank LA where patrons could make a donation and earn more Free Comic Book Day books. 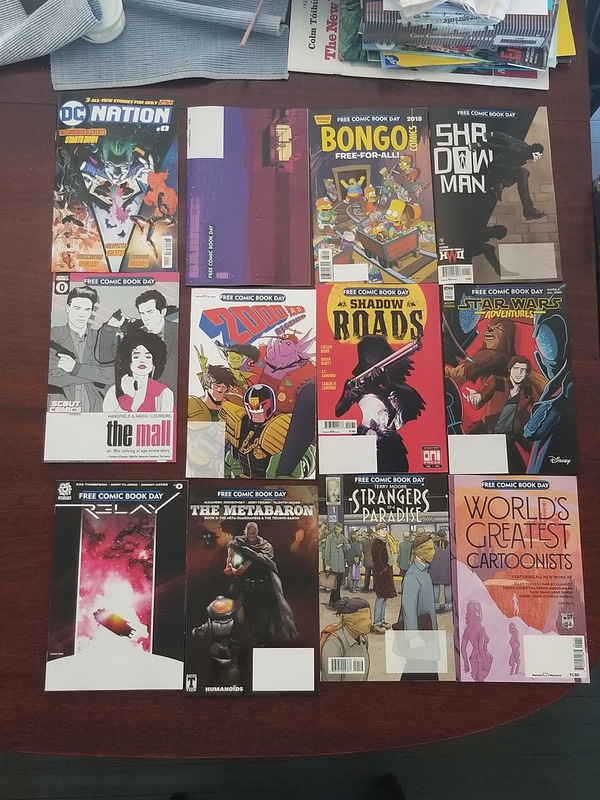 I made a cash donation and was allotted 11 books, twelve actually, since the shop was giving away the DC Nation #0 book, which was priced at a quarter. I guess they had so many they decided that everyone would get one no matter what. The DC Nation #0 is in the first spot, followed by, in Row 1: Image's Barrier #1 (of 5), a western-meets-sci-fi that is set to come out weekly for five weeks, and while I also got issue #2 on Wednesday, I've yet to read either; Bongo Comics' Simpson FCBD Special; and Valiant's FCBD special, the main book I go out for. Row 2 has Scout Comic's edition for the Day, with excerpts about a mall robbery as well as some of their other fare, all of which I'm ignorant of, something I should remedy. Next is the 2000AD FCBD edition, followed by the Oni edition. Britain's 2000AD put together what looks like a kid's style book, much less dark than the normal Judge Dredd universe material, and Oni produced a nice little taste of Cullen Bunn's latest western fare. Next was for my students, a young reader's Star Wars Adventures book about Han and Chewie. Row 3 stats with the Aftershock FCBD edition, with a preiview of their new sci-fi series and a taste of other offerings. Next is a book I didn't know would be available, but was excited about; a Metabaron piece from the Jodoverse by Humanoids. After that is Terry Moore's newest Strangers in Paradise preview, which looks great; and bringing up the last spot is a collection of the "World's Greatest Cartoonists." Those kinds of collections I really enjoy because they tend to be exclusively writer/artists with unique looks you'd be hard pressed to find outside of Drawn and Quarterly or Fantagraphics, and they always have interesting things to say. I haven't read all the books I plan on reading from this haul, but if anything is amazing and needs a write up, it'll be here.